High-speed internet service provider in India BSNL on promotional basis launched five new Broadband Unlimited Broadband plans for Nasik district internet users under BSNL Broadband services. State run Telecom Company Bharat Sanchar Nigam Limited (BSNL) comeup with new Unlimited Broadband plans ‘BBG ULD 545 CS131’, ‘BBG Combo ULD 675 CS132’, ‘BBG ULD 795 CS133’, ‘BBG Combo ULD 845 CS134’ and ‘BBG Combo ULD 945 CS135’ in Nasik telecom district of Maharashtra Circle from 21st July, 2016 onwards. BSNL is gaining maximum number of connections under Broadband services in all Telecom circles with attractive high-speed Unlimited Broadband plans starting from below Rs.500/- in few telecom circles where there is huge demand for internet usage. 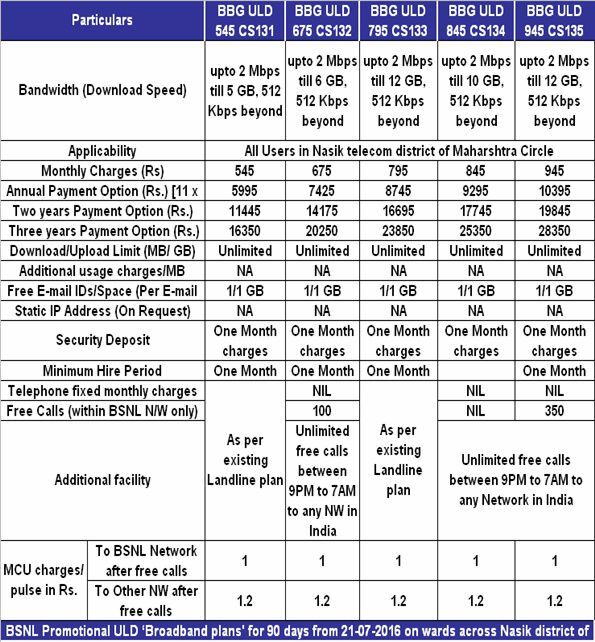 As per latest information BSNL competent authority on promotional basis introduced new five Unlimited Broadband plans offering 2Mbps high-speed internet service (Download speed) in only those locations / colonies of the Nasik telecom district of Maharashtra Circle where there is a matching competition from Private Operators. BSNL is offering 2Mbps speed high-speed internet services following condition FUP limit with payment option Annual, Two years and Three years. Customer subscribing to annual payment option will get annual discount of on Monthly rental charges upto six months and also Free Unlimited Night calling from 09:00PM to 07:00AM to any network in India. The above Unlimited Broadband plans will be implemented with effect from 21st July, 2016 for a period of 90 days in Nasik telecom district of MH Circle as promotional basis.